It's baked, not fried! 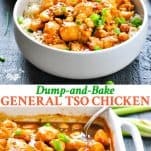 This Dump-and-Bake General Tso Chicken is a lighter, healthier version of the Chinese restaurant classic. With just one dish and about 10 minutes of prep, the easy dinner recipe is even better than take-out! It’s baked, not fried! 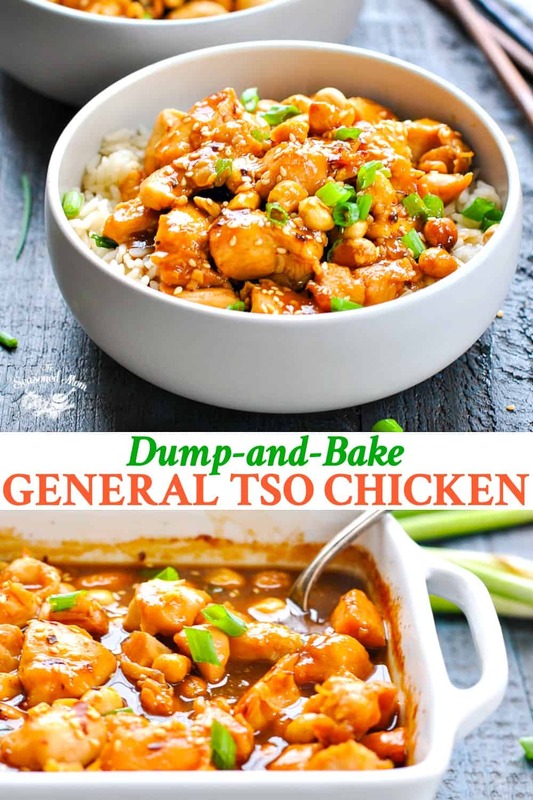 This Dump-and-Bake General Tso Chicken is a lighter, healthier version of the Chinese restaurant classic. 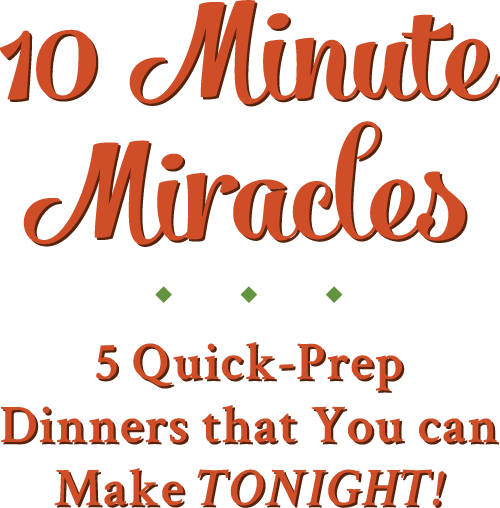 With just one dish and about 10 minutes of prep, the easy dinner recipe is even better than take-out! So…calling this “General Tso Chicken” might be a bit of a stretch. It’s definitely not authentic Chinese cuisine — but I’m not an authentic Chinese gal, either. 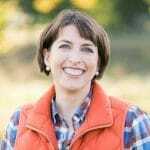 Now that I think about it, the General Tso Chicken that we all know and love from our favorite Chinese restaurant isn’t exactly “authentic” Chinese cuisine either. Instead, it’s an Americanized version of Chinese food, which still happens to be incredibly tasty! 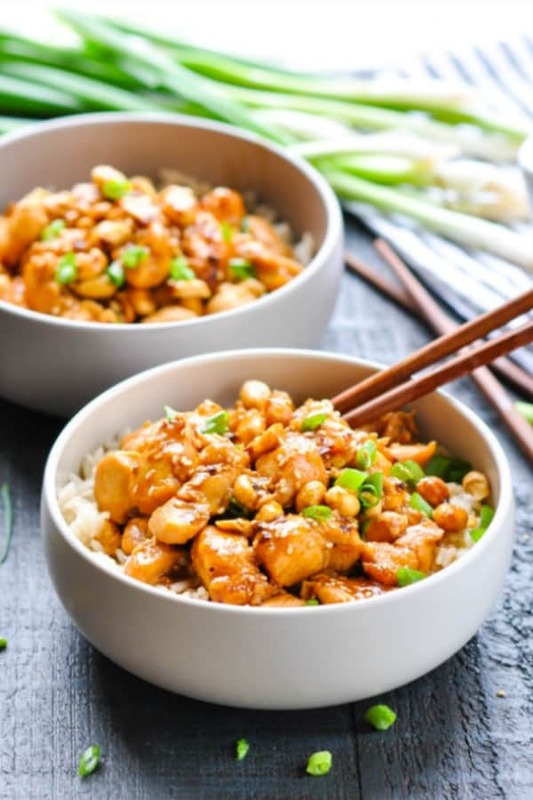 General Tso Chicken is deep fried chicken that’s sweet and slightly spicy with a sicky and delicious sauce. My version, however, is baked instead of fried so it’s so much healthier and safer to cook (no hot oil anywhere). Also, I’ve created the easiest dump and bake recipe for you so there’s minimal prep and effort involved but maximum flavor! 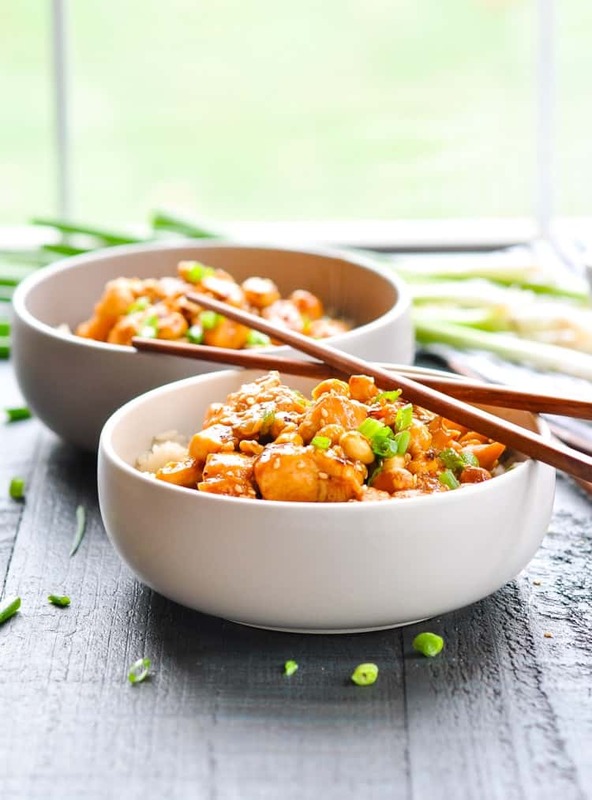 Whether you call it General Tso Chicken or something else entirely, the bottom line is that this Asian-inspired meal is about to be devoured by every single member of your household…and that’s what I call a success! Brown sugar – you can use regular sugar but brown gives a deliciously sticky, caramelized flavor. 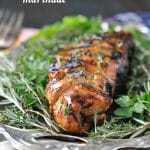 Hoisin sauce – gives a huge flavor punch and important to this dish so don’t skip it. Did I mention that my General Tso Chicken is baked, not fried? That means that you won’t feel weighed-down and sick to your stomach after your meal, you won’t have to stand at the stove with a hot pot of oil to tediously fry individual pieces of meat, and you won’t have to spend your precious money on overpriced restaurant fare. WIN-WIN-WIN! This is lighter, healthier, and dare-I-say BETTER than the original! 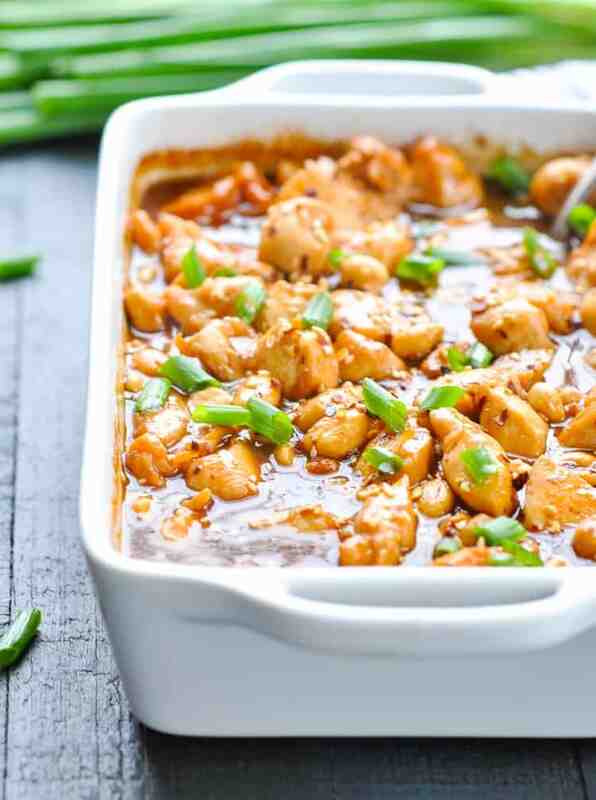 I’ve created a sweet and savory sauce that you whisk together and pour over your raw chicken. It all bakes together in one dish as the sauce bubbles and thickens. 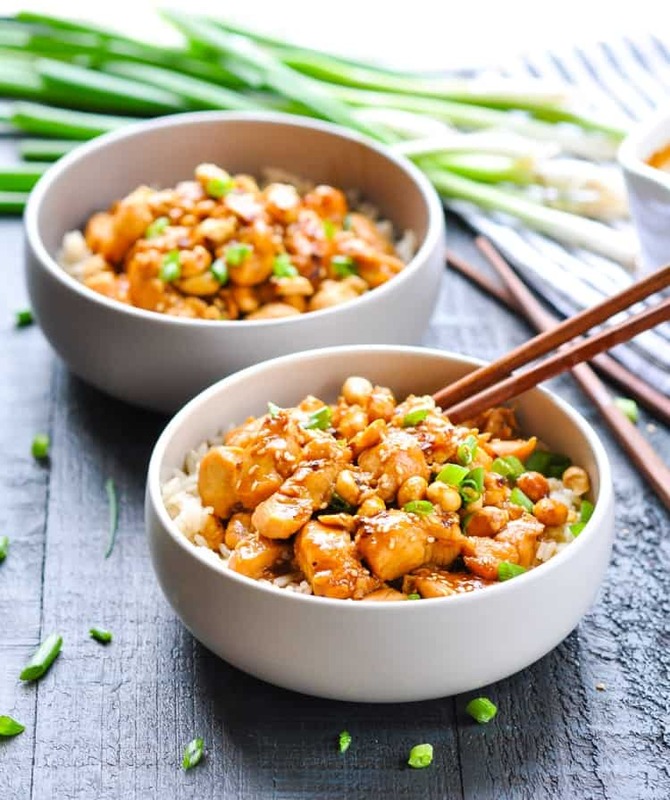 Stir in some peanuts at the end for crunch, garnish with sliced green onion and toasted sesame seeds, and you’ve got a restaurant-quality meal ready in minutes (without many dishes to wash at the end)! In a separate bowl, whisk together chicken broth, brown sugar, hoisin sauce, sesame oil, salt, garlic, ginger, and red pepper flakes. Pour sauce over chicken and stir to combine. Bake, uncovered, for 20 minutes. Stir, return to the oven until chicken is cooked through and sauce has thickened. Remove from oven, stir in peanuts. Season with additional salt and red pepper flakes, to taste. Garnish with sliced green onions and sesame seeds just before serving. 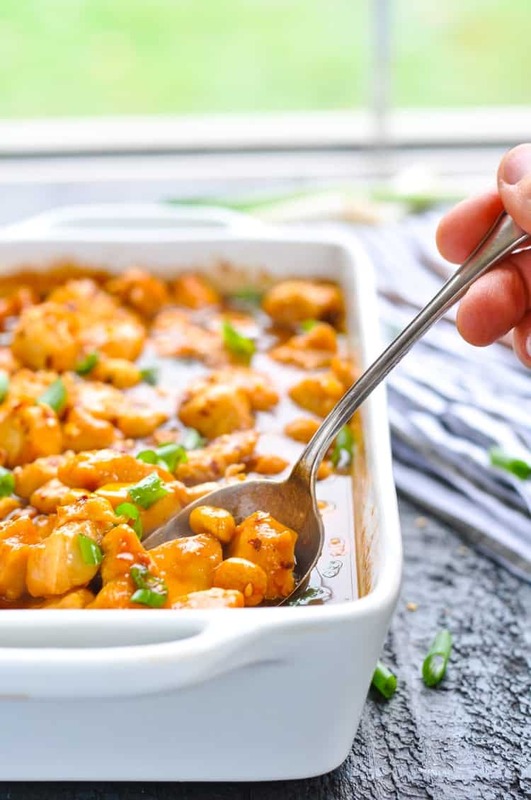 Serve the General Tso Chicken over rice (or over cauliflower rice for an even lighter dish), with plenty of extra sauce spooned over top. We love it with steamed broccoli tossed into the mix as well! This is one meal that your whole family can enjoy together — no breaded, fried chicken necessary! Cooking Just for Two? 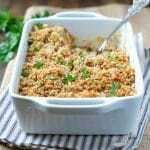 Cut the ingredients in half and bake the chicken in a smaller dish. The cooking instructions remain the same. Preheat oven to 425 degrees F. Spray a medium baking dish with cooking spray (I have used a deep 9-inch by 6-inch dish and an 11-inch by 7-inch dish, and both work well). Wow. SO into this recipe. Easy, delicious and whole-family-pleasing. Definitely need to try! Was going to make broccoli and cheese soup today but then saw this!! Ah, soup not happening!! Maybe another day. Thanks so much Blair another awesome recipe to add to my 5 yum list!! Oh, can’t wait to try this! Looks delicious..thanks for sharing. I just made this for dinner and my family LOVED it! My son had to get used to the fact that it wasn’t fried but he had two helpings and my husband gave it a 10 out of 10. Keep sending the great recipes! It is in the oven right now. It already smells wonderful! Will serve with coconut rice. I hope there will be leftovers for lunches! Perfect! Love the idea of pairing it with coconut rice. So good! 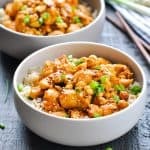 Do you have anything similar for sweet and sour chicken? Most recipes I see have you frying the chicken before the oven, but I really do not like to fry anything. Hi, Lillie! 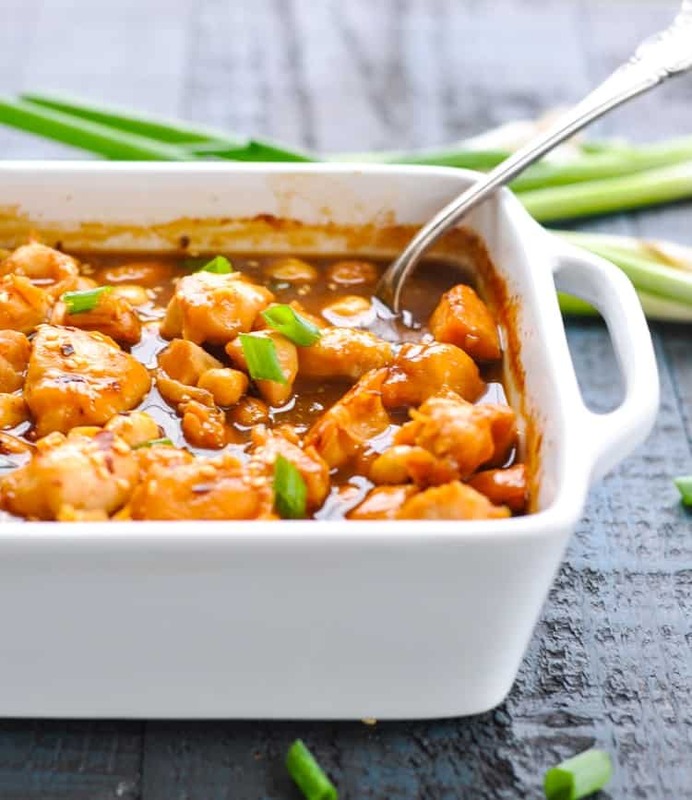 No, I don’t have a sweet and sour chicken recipe like this one, but I am definitely adding it to my list. Stay tuned, and thanks for that inspiration! Hi Blair. I made the General Tso chicken tonight for dinner & it is amazing. I served it over quinoa & oh so good. Definitely a keeper. I enjoy your weekly update on what your family has been doing, always uplifting & makes me smile while reading. Your boys are adorable. Thanks again for the great recipe, I’ve made many of your recipes & they are all so good. Hi Blair, I made this for dinner last week, it was so easy just steam some broccoli and rice for sides and dinner was ready. Everyone liked it, even my picky teenagers. Thanks. Made this tonight and it was both easy and delicious. I didn’t have rice but did have rice noodles! I have just discovered your site! Can’t wait to see what else is here! That’s wonderful, Mim! I hope that you find plenty of other tasty ideas on the blog! 🙂 So glad that you found the site! 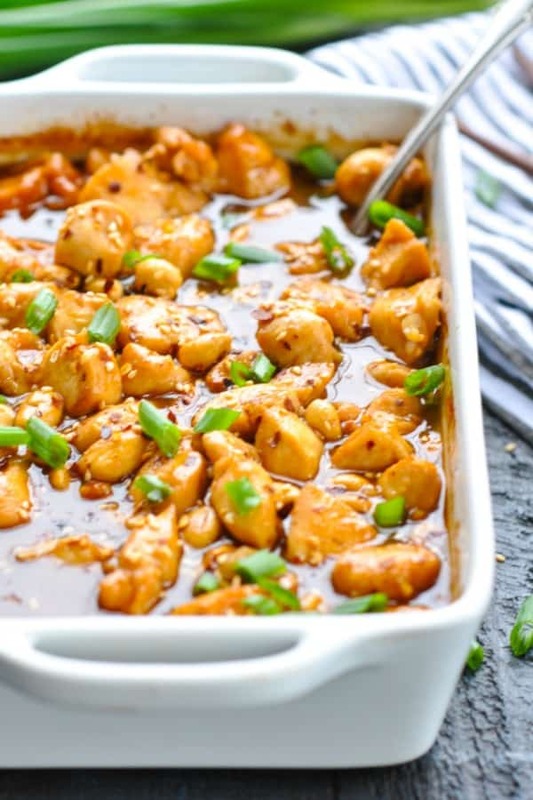 General Tso’s Chicken is one of our favorites. We gave my brother-in-law a slow cooker months ago. Now he wants to learn how to use it. So I’m giving him my recipe for for beef stew. But I also want to bring him dinner. Can the recipe be made in the slow cooker? We love that it’s a healthier version of a recipe recipe we love. Ee’ll be seeing him on Sunday. I’ve been enjoying your site & blog immensely. Hi, Robert! Yes, I think that this recipe would work well in the slow cooker! 🙂 Thanks for your kind note! Vegetarian here. I make it with tofu. No knocking it, now, till you’ve tried it. That was delicious! Way better than any of our local Chinese take outs. Thank you! That’s great, Mandy! So glad that you enjoyed it! Made this last night and it was easy and delicious! I didn’t have any chicken breasts so used bone in skinless thighs instead, a little bit less sugar and chose Asian chili garlic sauce (which we love!) instead of red pepper flakes. So easy to put the sauce together and “dump” it over the chicken, then get the rest of dinner ready while it’s baking. Wonderful flavor! Thanks for the recipe! Hi, Norma! I’m so glad that you enjoyed it! Thanks for letting me know. 🙂 I bet that Asian chili garlic sauce was perfect in the dish! This is delicious! I liked that I could cut the recipe in half for 2 people. I followed the recipe exactly except I didn’t add the peanuts. My husband said this recipe is a keeper! Thank you! 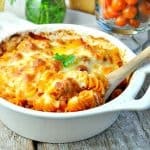 We are making this for dinner! Recipe says it is for 4, but nutrition says a serving is 1/6 of the recipe. I am confused. Hey, Melody! The recipe should say that it serves 4-6. 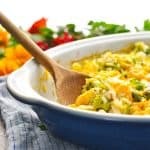 The -6 part got cut off when we updated my site to use new recipe cards, and I haven’t had a chance to go back and update this particular post yet. 🙂 The nutrition information is for 1/6 of the recipe. Hope that helps clarify, and enjoy the meal!